In recent times, we are experiencing the dawn of an era where women are incurably committed to taking over the leadership of territories originally renowned for their history of patriarchy, oligarchy and subordination of women. In the same vein, emerging economies are currently home to a new generation of Women, who are taking risks in their professional lives as politicians, entrepreneurs, heads of conglomerates and public stewards to build a more sustainable future for their regions. However, the gender gap in leadership roles still remain, with women at the tail end of all forms of biases that make it impossible to either access such heights or contribute to any sustainable growth due to the abortion of their time in leadership positions. PricewaterhouseCoopers latest ‘World in 2050’ report reveals the potential of emerging economies being positioned in the league of largest economies in the world by 2050. As such, the role of women leaders as key drivers of this economic catch-up growth cannot be overemphasized. 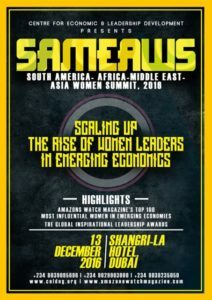 Therefore the 4th edition of the South America- Africa- Middle East -Asia Women Summit, is to converge the most influential women leaders and stakeholders in emerging economies to consolidate efforts in supporting and scaling up opportunities for women leaders in these regions as well as deliberate on sustainable ways of multiplying the number of women in leadership positions in emerging economies, thereby creating diverse possibilities for upcoming women leaders. 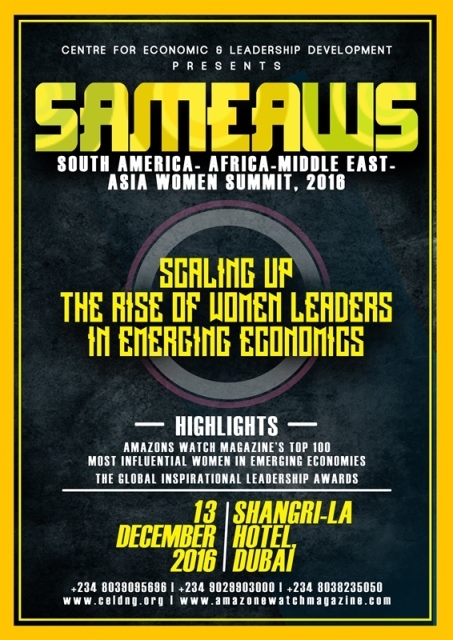 The summit will culminate into a glamorous unveiling of the Amazon’s Watch Emerging Economies Top 100 Most Influential Women, aimed at showcasing and documenting the achievements of the regions’ finest women leaders.